Social Media Workshop tomorrow, 11/14. We invite everyone - politicos, non-profits, school representatives, business leaders, community leaders, Rotarians, our Chamber members, etc. to all come together to share in a breakfast and enjoy our speaker, Donna Wright Sommerville, co-founder of Grateful Gatherings. We only have a few tickets left. Register here. Donna, our keynote speaker will present "Furnishing Homes with Hope". Event starts at 7am and ends by 8:30am. Pastor Dan Senter from Our Savior’s Lutheran Church will provide the Invocation and Rev. Robin Wells from the Lafayette United Methodist Church will do the Benediction at the end of the breakfast. 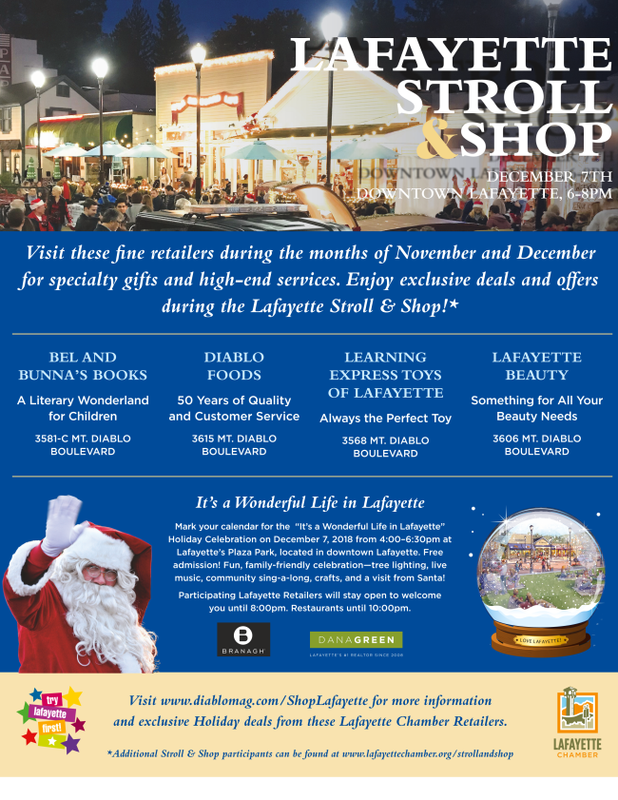 Help us Spread the Word about Lafayette Stroll and Shop! 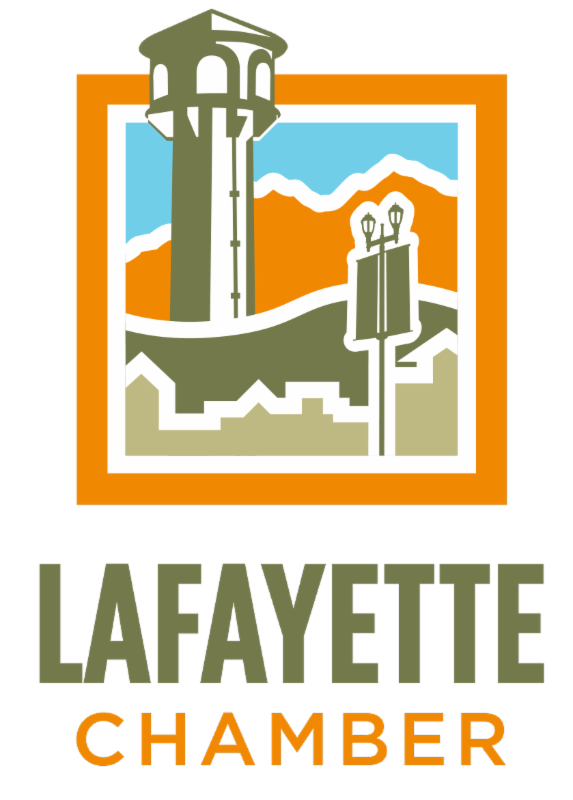 Lafayette Stroll and Shop is rapidly approaching on December 7th. We have been marketing this event and Diablo Magazine is as well. We would like to encourage you to email your clients and partners about your promotions/special pricing and put the flyer in your window or your counter. You can view the flyer here but a full color copy will be included in the printed newsletter you should receive in the next day or two - if you haven't already! If you need more information about the event, feel free to call the Chamber at (925) 284-7404. More information about the event here. If you are a local business or restaurant and would like to participate in this event, please contact the Chamber and we will put you on the list that will be distributed at the “It’s a Wonderful Life” Holiday event as well as being listed on our website. Sign up early for the most promotion! 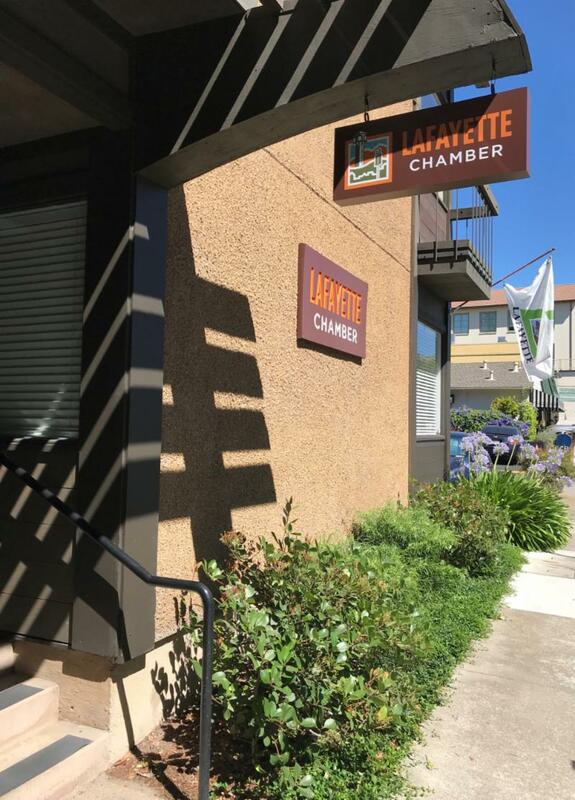 The project manager for EBMUD has informed Matt Luttropp, Engineering Manager for the City of Lafayette, that the contractor paved the parking lot last Friday. This week he plans to install landscaping, parking meters and stripe the lot. The goal is to have the lot open to the public after the Thanksgiving holiday. For more information contact mluttropp@ci.lafayette.ca.us. What the heck is an E-Wallet or Digital Wallet? Ever heard of PayPal, Apple Pay or Android Pay? Of course you have. But as a business, are you accepting these forms of payment? Are you personally using these apps and services. Learn why the U.S. is far behind China, India and Europe. You may find you are missing out on sales by not offering these options. This workshop will be hosted by the Moraga Chamber at Hacienda de las Flores from 5:30 – 7:00pm. RSVP to kathe@moragachamber.org. 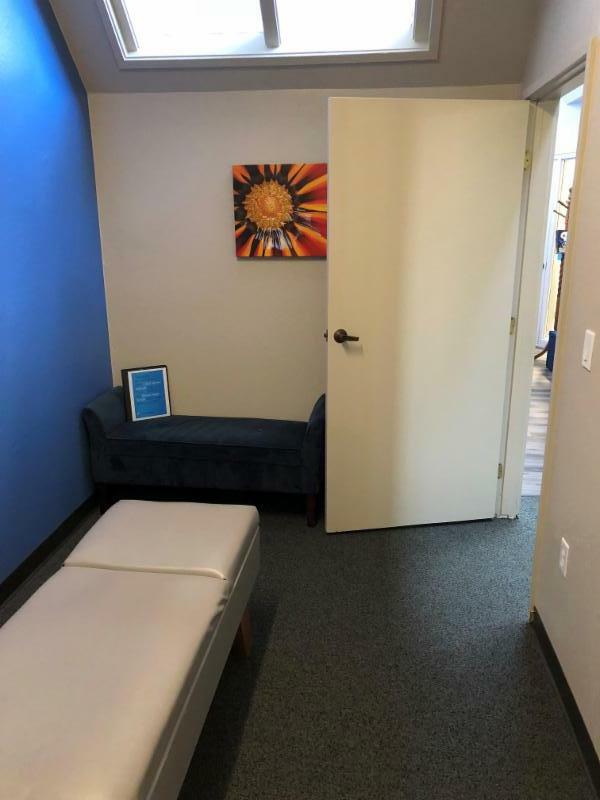 Build your own massage therapy practice in the highly sought-after market of Lafayette and surrounding areas of Walnut Creek, Moraga, and Orinda. Brand new, remodeled chiropractic clinic with shared treatment space available. Currently occupied by two chiropractors looking to build an in-house referral network to offer complimentary care & services to our patients. Open to all healing / bodywork / therapy practitioners. Please call 925-385-8353 for more information. Need A Turkey? Early Diagnosis Foundation is providing Free Turkeys to those in need. The Early Diagnosis Foundation, a non-profit organization based in Lafayette is hosting a "Turkey Donation Day" on November 20th from 3-7 pm at 1010 Oak Hill Road in Lafayette. If you need a Thanksgiving turkey or know someone who does to enjoy the holiday, please reserve your turkey before we run out! Contact Ariana at arianafort@gmail.com or call 925.330.6865. Pick up your turkey or we can arrange to deliver it to you. Event sponsors include the Lafayette Chamber of Commerce, Woehrle Development, Whole Foods, Diablo Foods, Safeway and private donors. If you'd like to be a sponsor or make a donation to purchase turkeys for our local communities, contact Ariana. As we honor our veterans, please bear in mind those among them that are without stable housing. They may be “couch surfing”, living out of their car, or staying in an RV or garage. They may even be on the streets or in encampments. SHELTER, Inc. is here to help connect veterans with housing through SSVF (Supportive Services to Veteran Families) and to employment through HVRP (Homeless Veteran Reintegration Program). We will also assist with referrals to additional resources. Please help us reach veterans in need by sharing this flyer https://shelterinc.org/programs/hvrp.html at your local bulletin board, house of worship, or anywhere you may volunteer this holiday season, so they can be connected to these additional resources. 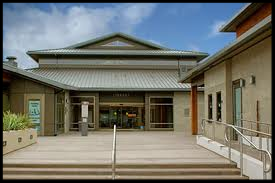 We are able to assist veterans in Contra Costa, Alameda and Solano Counties. Wednesday, November 14, 11:30am-1pm, Massimo’s Ristorante - 1604 Locust Street, Walnut Creek, Walnut Creek city parking lot located immediately across the street. Keynote Presentation: “7 Steps to Wealth” by Hilary Hendershott, owner of Hendershott Wealth Management and nationally-known personal finance expert. MDBW members $29, visitors/guests $35. Participants must register in advance at www.mtdiablobusinesswomen.org. Optional $1 raffle tickets (onsite, cash only) benefit the Bay Area Crisis Nursery. Lamorinda Entrepreneurs’ next Panel will feature a fascinating discussion on starting, growing and running various food businesses in a variety of formats. The panel will include local food entrepreneurs: Kendall Glynn, COO, Square Baby; Linda Hofmeister Co-Owner Hofssi Chocolates; “Chef Charlie” Charles Vollmar Owner, Epicurean Exchange. Our Moderator will be: Lauren Herpich, Owner, Local Food Adventures. No matter what your business is, you’ll find valuable takeaways as you learn about the challenges, opportunities, and strategies in the food space. $10 Tickets available here. No host bar. Please note Orinda Country Club dress code: collared shirts for men and no denims. Learn more about Lamorinda Entrepreneurs here. Find a unique treasure from a local artist, all art priced under $500! Friday, November 16, 2-6pm, 3589 Mt Diablo Blvd. Bring a friend, includes wine & cheese! Express Hydrafacials - $50 to RSVP. Your $50 fee can be applied towards your purchase when you book a series at the event. Microblading - Book at event & receive $150 off. Lash Extensions - Book at event & receive $100 off. Hofssi Chocolates is your local Lamorinda Chocolatier for your Holiday Gifting and Holiday Parties! Our Holiday Store will be open November 26 through December 23 in Lafayette inside Alicia Klein Showroom at 3541 Wilkinson Lane, behind Papillon Cafe. We offer gifts and gift baskets in every price range--Mouthwatering Caramels, Toffee, Bars, Mint Meltaways, Peanut Butter Cups and more! All include as many Organic Ingredients and Sustainable Packaging as practicable! 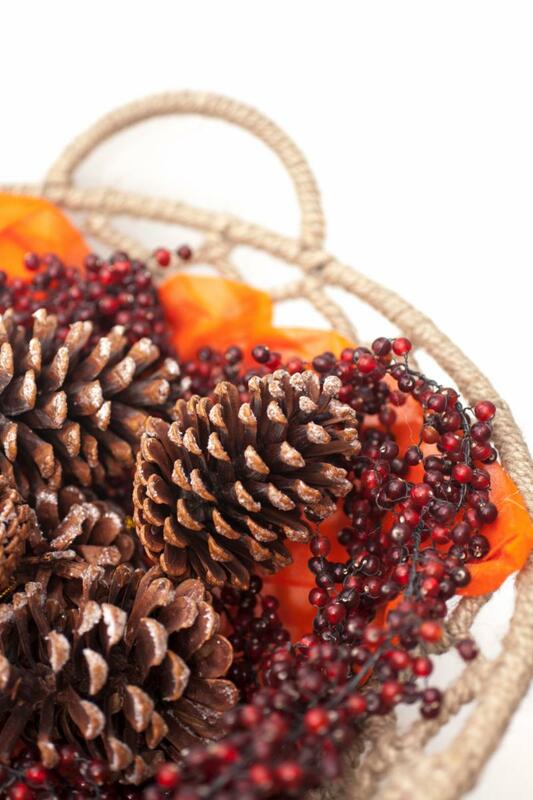 Holiday is a great time to show your clients and referral sources your appreciation for a great year! See HOFSSI.COM! Kennedy Wilson is pleased to host a workshop for landlords interested in leasing to the cannabis industry. Please join us on November 29th from 6 p.m. to 8:30 p.m. as we review the topics critical for successful leasing in this market segment. You will hear representatives from Wendel, Rosen, Black & Dean, Commercial Coverage, Grow Builders, Inc., Stewart Tittle, & the City of Antioch discuss the latest market trends for this emerging market. RSVP is requiredto Eric Rehn, CCIM, Vice President, Kennedy Wilson Brokerage Group, (925) 784-3449, erehn@kennedywilson.com. Founded in 1993 by Sam Coronado, the Serie Project envisioned a workshop where underrepresented artists could benefit from collaboration and learn the serigraphy technique, a print technique also known as screen-printing or silkscreen. In the last two decades the organization has fostered over 250 artists from different professional levels and ethnic backgrounds, who together have produced a rare and special collection of serigraphs. For more information and to register for this free event click here. Good medicine takes more than amazing technology; it takes time — time to respond to bodies as well as data, time to arrive at the right treatment. Join us for a stimulating discussion with physician Victoria Sweet about her book, Slow Medicine. For more information and to register for this event click here. Science and magic? It doesn’t get better than Xtreme Science Magic! This lively and interactive show is jam-packed with experiments, demonstrations, and loads of audience participation. Geared for ages 5 and up. For more information and to register for this free event click here. This two day class (Monday and Tuesday) will feature robotics, engineering & programming concepts to students using iPads and programmable LEGO bricks. Registration is required. Limited Spaces available. Learn more here.